I have been such a procrastinator this month! Well, mostly when it comes to cooking. Although in life I tend to be an inadvertent procrastinator. I would always begin my projects, assignments and homework with the best of intentions. I loved the first week of classes in college because it held such promise. The professors would hand out their syllabus and I would look it over with the precision of a ketchup bottle. Hmm, that’s not right, but for some reason that is the first thing that popped into my head. So yes, like a precise ketchup bottle I scanned the calendar. I would transfer the dates of exams, papers and other assignments into my assignment notebook. Purple for English papers, green for inorganic chemistry, blue for calculus, it was very colorful and organized. I always wanted to be one of those people that would write a paper ahead of time. Finish it early with enough time to look it over and make corrections. That almost never happened. In fact, I usually write my posts as a running thought process (hence the ketchup bottle) and usually don’t proofread (hence the occasional text message from my mom to inform me of a typo, thanks mom!). My procrastination takes center stage today as I post my Daring Baker’s challenge! I have several excellent reasons for procrastinating this month. First, I only shop twice a month for groceries. It is because of this that I did not even have the ingredients until April 14th. Second, I’ve been spending weekends at boyfriends house. Boyfriend lacks all of the fancy cooking tools that I own, examples? Boyfriend does not own mixing bowls. As I write this, my maple/gelatin mixture is cooling on the stovetop. 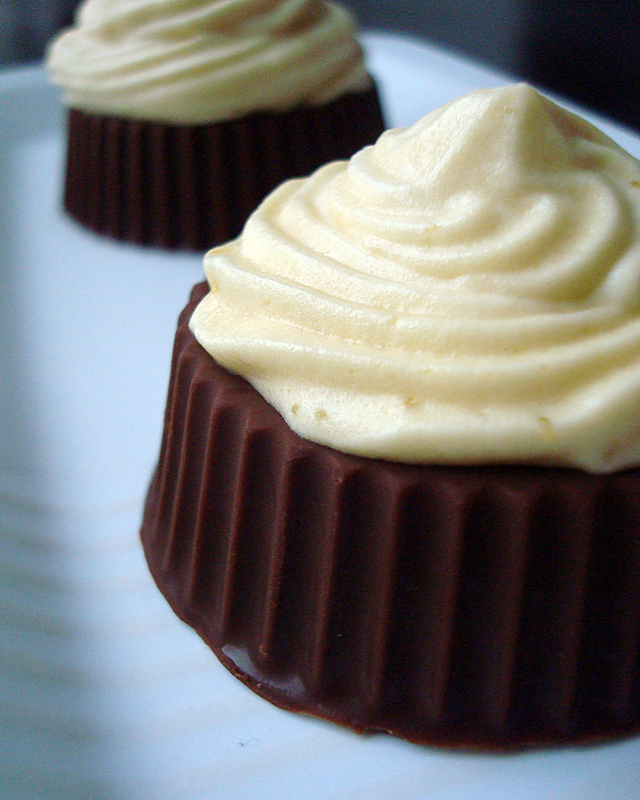 I am getting ready to whip the heavy cream and my chocolate shells are chilling in the fridge. In twenty minutes I will have completed this challenge, a mere hour before the deadline! I’m such a slacker. Be sure to check out some of the amazing edible containers made by the other Daring Baker's! I phoned it in a little with the chocolate cups, but I just got the mold for easter and wanted to try it out! Thanks Easter Bunny! When making this mousse, be sure to use real maple syrup. No Aunt Jemimas here, the real stuff. I also realize that maple syrup is exceedingly difficult to find outside of North America. Daring Baker's is such an international group, you'll be amazed at some of the options that they came up with! Personally, I thought that this mousse was way too sweet. Maybe it's because I'm used to my beloved Aunt Jemima "maple syrup." To counteract the sweetness I decided to make my edible container out of dark chocolate. Fantastic balance of flavors.